really, soaps, whats so fantastic about soap? Well, these, these are freaking fantastic!! First off look at this store! It is just popping with color and creativity. And I couldnt love that more! Now these are some hunks of soaps, huh?! look closely...these aren't just ordinary boring soaps. Every single slice has something fun created into your individual slice piece of soap. I told you, it wasn't your boring grandmother's bath soaps. They would totally make a bathroom or kitchen fun immediately. I have the flamingo one in my beachy bathroom and of course a yummy cupcake in the kitchen. Like you just want to eat them, delicious. And Milagros doesn't just make pretty soaps. 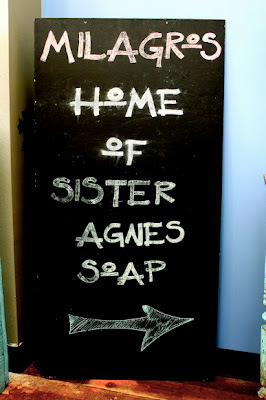 For all your local readers in Tampa Bay, you can have a party and make your own soaps with your girlfriends! Or, if you are having a baby or wedding shower, think how cute these would be as favors. Now, you can purchase Milagros soaps by going to Sister Agnes and you can even purchase them wholesale to sell in your own shop. They have two locations- one in Downtown St.Pete and one at Hyde Park Village in Tampa. Please go like their Facebook Fan Pages to check out some more eye candy. Milagros loves Nap Time Is The New Happy Hour and wants to do a giveaway to my readers! 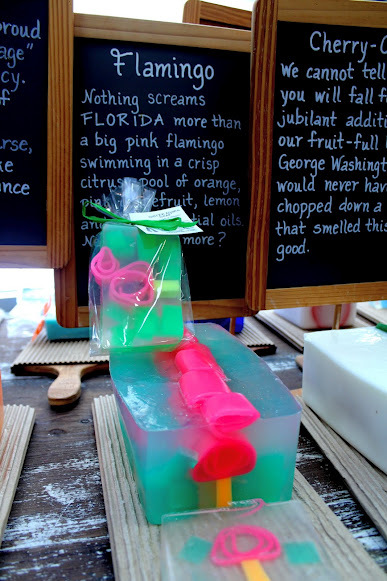 So, now you can have some fun, yummy soaps in your home. THEY ARE GIVING AWAY 2 BARS OF SOAPS TO 5 READERS! Please go enter below through Raffelcopter. The giveaway ends on March 31st. These lovely photos were taken by Jasmine Tran. This soap is so fun! Love these. These would make such cute gifts. They look adorable! I would love to win. Would love to give these away at baby showers!!! I love custom soaps - they always smell so good. I live right by the St. Pete one! I have always wanted to go, but haven't yet. I will have to check them out. Thanks for the giveaway! Thank you for the giveaway. Cute soaps!! What fun looking soaps! I would love to try any of these designs! Those are so cute! Who knew soap could be so fun?